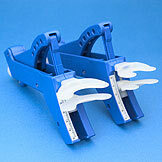 The TheraBite is the oldest and best know jaw motion rehab system. 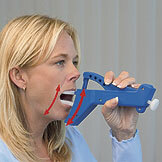 Used after head & neck cancer, irradiation fibrosis, TMJ disorder, strokes, trismus, jaw surgery, tm total joint replacements, and more; the TheraBite helps patients regain motion and joint function in their face, mouth, and jaw. For more information, and to order with insurance. Visit us at www.craniorehab.com for details, products, and accessories, here: The TheraBite system. Available in Standard (AT1000) and Pediatric (AT1005) (<10yo). The TheraBite device provides a curved, anatomically correct stretch for patients to treat or rehabilitate their jaw and temporomandibular joint. 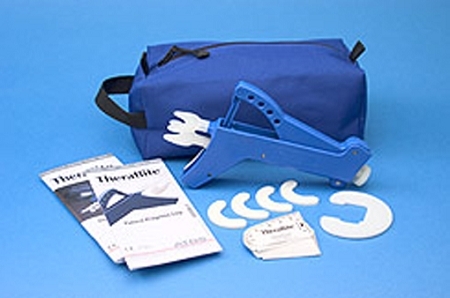 The TheraBite system can be used for stretching, passive motion, and muscle strengthening. By utilizing the TheraBite system, a user can increase their range-of-motion, improve their jaw and joint function, and reduce swelling and pain. The Pediatric version is for patients under 10 y.o. (3.1cm across).